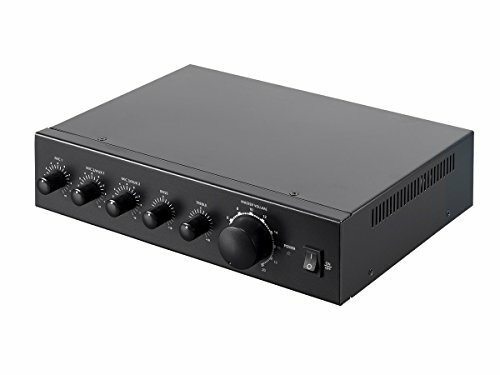 This amplifier is designed to drive a conventional 4-ohm or 8-ohm speaker system as well as 70-volt and 100-volt constant voltage speaker systems. It features three unbalanced 1/4" microphone inputs, two of which can be switched to unbalanced RCA and 1/4" auxiliary jacks instead of microphone level inputs. Small flexible public address system for restaurant or retail space that needs music playback and/or mic annoucements. Easy to use 1/4" and RCA inputs for mics, music, or television feeds. 5 inputs on 5 channels allows simple configueration of sound sources. Separate Bass and Treble control to dial in the sound for your paticular environment.